And like all the best and most important questions, there isn’t a simple answer. In terms of performance, your feet are arguably your most crucial point of contact with the bike. Bad shoes, or more precisely badly fitting shoes, can mean pain, injury, sub-optimal cleat placement and more pain. All of those things can cost you power, speed and enjoyment. Which means I am always surprised by the number of clients – and I’m talking about a significant majority – who buy their shoes online, totally blind. I won’t preach, because I’ve done it myself over the years. But while we know they’re cheaper, and we know they look bling bling in that fluoro/pearlescent/whatever, do they fit? Experience tells us that, regardless of sizing and/or width fitting options, some people just do not suit some shoes. So, the golden rule: Try before you buy, even if it costs you a few quid extra. And almost as importantly, find a retailer with a good selection across different brands; that way at least you’re giving your feet some different reference points in terms of feel. Take out the insole, place your foot on it; are you spilling over the edge or sitting nicely within its boundaries? If you know your ideal cleat position, is it achievable? Different manufacturers drills holes in different places and even the best fitting shoe is massively compromised if your cleats are 1cm out of whack. Think less about the width of the shoe and more about the overall volume. A bigger, taller foot can make even a wide shoe feel narrow as the upper is pulled tight across the foot. Look at the quality of the insole? Is it thick? Thin? In between? Generally, although not exclusively, stock insoles are pretty poor. 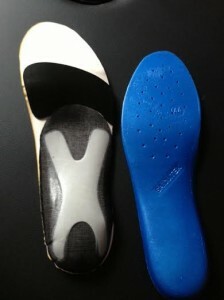 So, if you’re using a footbed – like the Sidas available here: http://www.fit2ride.cc/sidas-custom-footbeds/ – or an orthotic, make sure there is room in the shoe to accommodate them. In terms of the fit of the shoe though, trust your instincts. If they feel right, and everything else is equal, then they probably are right. This entry was posted in fit2ride news and tagged bike fit, bikefit, calderdale, cleat position, cycling, cyclo cross, footbeds, halifax, lancashire, position, saddle height, Sidas, training, yorkshire on f 30, 15 by jamesr. It is hard to imagine as I write this – there’s an inch-thick layer of ice outside the front door – but spring will soon be here. Hopefully. And by late February or early March, the early season time trials, road races, triathlons and sportives will be popping up on the calendar. So, if those are your targets – and the New Year training load is about to ramp up in anticipation – it makes sense for the rest of your preparation to keep pace too. In bike fit terms, ideally that means making any potential changes now, rather than leaving it until later in the season. You can make mid-year alterations to your position – and I see plenty of riders through the summer months – but there are downsides. In well conditioned athletes there is inevitably a period of adaptation after a fit, especially if significant adjustments have resulted; the body takes time to adjust to new demands. And to give yourself the best chance to make those adaptations, it is better if they are done during training rather than competition. Asking your body to deal with a different bar height, cleat position, reach or a pair of new footbeds while riding full gas intervals is not ideal. It can be done, of course, but, logically, it is not optimal. It might even be damaging. Which brings me back to a point I’ve made before: Why compromise? Why leave a stone unturned in the search for performance gains? If you’ve already picked up those carbon tubulars and ticked the boxes on the coaching and training fronts, it makes sense to check your position on the bike. And the best time to do that is probably now. This entry was posted in fit2ride news and tagged bike fit, bikefit, calderdale, cleat position, cycling, cyclo cross, footbeds, halifax, lancashire, position, Sidas, training, yorkshire on f 29, 14 by jamesr. Since the cross campaign kicked off, I’ve had a few discussions about the requirements of cross-specific bikefit. So here are a few thoughts. First, a good fit, and the edge it can give a competitive rider, is as relevant in cross as it is in road, TT, tri or track. The truth is this: If you’re fighting against the bike rather than working with it, you’re going slower than you should be, whether you’re in a muddy field or on a stretch of road. The core principles of a fit for cross are the same as they are for road; biomechanical efficiency, good foot stability, neutral posture and weight distribution, all built around the physiology of the individual rider. But there are also subtle differences, resulting from the unique demands of the discipline, that probably make it a more intriguing process than a fit for tarmac. Starting at the foot, cleat position can be a little more aggressive, maximising leverage for those stop-start accelerations, even if that means slightly compromising spinning smoothness. Saddle and bar position can vary significantly too. An aggressive road race fit can pin the rider in one place on the bike; for cross the ability to shift weight on the saddle to cope with the terrain, while maintaining pedalling efficiency, is crucial. Cross is actually one discipline where you can even make a convincing case for event-specific saddle height when you compare the technical demands of an event like The Three Peaks with a flat, non-technical ‘criterium on grass’. And where a competitive road fit may see the position optimised for a client to spend long periods of time riding on the drops, how relevant is that for cross, when hands-on-the-hoods is more like to be the default riding position when the hammer is down? Time to finally slam that stem and get lower? Possibly. How much difference could it all make? Combined together, over the course of a long, hard winter’s racing? There are no absolutes, but the little things have a habit of adding up. And when you’ve got the bikes right, the tubs glued and the training dialled, where do you look next to try and find that winning edge? This entry was posted in fit2ride news and tagged bike fit, bikefit, calderdale, cleat position, cycling, cyclo cross, footbeds, halifax, lancashire, position, saddle height, Sidas, training, yorkshire, yorkshire points on f 16, 14 by jamesr. A self-confessed bikefit sceptic once told me that ‘there’s always someone who will pay to have their bars moved 5mm’. What he meant, at least what I think he meant, was that such a small adjustment was insignificant, let alone worth laying out cold, hard cash for. But what if that 5mm – the right 5mm – is the difference between a race win or finishing in the pack? Or efficiency and niggling injury? And when it comes to bang-for-your-buck from a bikefit, less really can be more. Taking things to extremes, there are two polar opposites on the client spectrum. At one end is the cycling rookie: New to the sport, new bike, with no historical points of reference when it comes to their position. At the other is the experienced, competitive rider: Highly conditioned, tens of thousands of miles under their wheels and extremely adapted in terms of how and where they sit on the bike. For the former, measured changes to saddle, cleat and bar position during a fit can be huge and dramatic, purely because they were a blank canvas to start with. For the latter, alterations can sometimes amount to millimetres here and there; fine tuning to wring the last few percent of performance from an already well-oiled machine. The point is that alterations to position are relative to the individual rider, their background and their ambitions. The racer will feel, and potentially benefit, from those few millimetres just as much as the rookie notices that multiple-centimetre change to his saddle height. 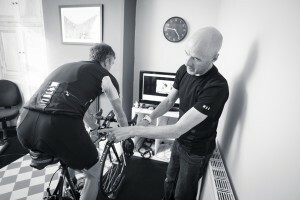 Ultimately, a bike fit should be about self-improvement and helping the client be the best they can be. And for some, that means that 5mm really could provide an edge. This entry was posted in fit2ride news and tagged bike fit, bikefit, calderdale, cleat position, cycling, footbeds, halifax, lancashire, position, saddle height, Sidas, training, yorkshire on f 13, 14 by jamesr. Rest day ramblings: Individual uniformity? I’ll say it again: There is no foolproof formula for bikefitting, no magic wand that will conjure positional perfection. There are elements of precision in the process, but also plenty of grey areas and skill-based judgments. Which means a fit reflects the style and personal aesthetics of the person carrying it out. As surely as a painter signs his canvas, the fitter has their own fingerprint, their style. Topically, look at the Tour de France. I’ve seen some fits I particularly like the look of over the last fortnight. I tweeted my geeky appreciation of Jack Bauer of Garmin after his so-near-and-yet-so-far exploit into Nimes, Tony Martin’s aero tuck on his solo epic was a thing of beauty, and Geraint Thomas’s trackie-esque up-and-forward poise served him well as he dragged Richie Porte’s muddied carcass over the cobbles of northern France. I’ve also seen some I’m less struck on, mainly involving French teams and BMC’s Tejay van Garderen impossibly lanky limbs, but that’s another story. When the race resumes in the Pyrenees, take a longer look at the riders. Having spent some time with Cyclefit, I can spot their pawprints on Trek Factory Racing. And that same collective uniformity is evident in other teams too; Belkin, Saxo, Garmin, GreenEdge. Indeed, Sky posted a rest day line up shot of their surviving riders spinning on the rollers in the mechanics truck; seven riders with seven almost identical back angles. The fits might be individual to each rider, but they all carry the signature of the fitter. Mainly that bikefit is indeed subjective. Cage two good fitters in a room with a client and a coffee machine and they might agree on 95 per cent of the fit, before arguing the final five per cent long into the night. On plenty of occasions, there are multiple solutions, all as valid as each other. Or, in Franglais, more than one way to skin Le Chat. Remember that next time someone tells you your saddle height MUST be 76cm…. This entry was posted in fit2ride news and tagged bike fit, bikefit, calderdale, cleat position, cycling, footbeds, halifax, lancashire, position, saddle height, Sidas, training, yorkshire on f 21, 14 by jamesr. There are two major motivating factors for bikefit clients. One: Performance gains. Two: Injury prevention or cure. Now, that’s a sweeping generalisation of the kind I try to avoid, but they’re the biggies. I’ve waxed almost-lyrical about performance fits before, so now it’s the turn of the broken and the almost broken. I’ve seen two clients this week, both of whom have significant injury issues. In both cases, it’s been ruining their riding, to the point where, at times, they’ve been forced off the bike altogether. In terms of cause and effect, both clients are very different. But they’re very similar in a significant way. Both have had extended periods of physiotherapy, but both felt frustrated by a lack of what they perceived as progress. In one case, they landed on our doorstep as a result of their physio’s recommendation. In the other, they had already arrived at the conclusion they needed to eliminate not just the symptoms, but the cause. There’s a reason for most cycling injuries. Sometimes it’s well hidden, sometimes not so much. But it’s normally there if you look hard enough. And treating the effect without treating the cause is potentially going to have you going round in circles. So if you do have a problem, whether it’s major or minor, get treatment. But also be motivated to get curious about why you need that treatment, especially if the issue is a chronic or recurring one. For the record, in both the cases above, relatively minor adjustments to cleats and saddle position made significant and very visible differences immediately. Will it fix those riders in the longer-term? Hopefully, but it remains early days. No one is claiming any miracle cure. They’ve started the process though and there’s every chance that the multi-disciplinary combination of treatment and fit will pay dividends for them. This entry was posted in fit2ride news and tagged bike fit, bikefit, calderdale, cleat position, cycling, footbeds, halifax, lancashire, position, saddle height, Sidas, training, yorkshire on f 2, 14 by jamesr. First rule of saddle height…. Out of all the measurements on a bike, saddle height is arguably the one that gives clients and fitters the most food for thought. It’s easy to see why. Too high, you get issues. Too low, you get issues. Just right? You get power, efficiency and a perfect pedal stroke. If that’s not a cycling holy grail, what is? The problem is that, for some clients, the difference between success and failure can be a couple of millimetres, which makes it a difficult bullseye to hit. You can find plenty of formulae for saddle height; on paper, in cyberspace, on club runs and in bike shops. Percentages of a rider’s inseam measurement, various variations of the old heel on pedal idea and knee angles of anything between 45 and 25 degrees. But for me, the first rule of setting saddle height is that there aren’t any rules. Like most aspects of fitting, there are too many variables. And it’s not just how long your legs are and whether you can touch your toes, although we make clients do that too. How do you pedal? Toes down? Neutral? Where do you sit on the saddle when the heat is on? On the nose? Or slide backwards? Those factors alone can make a massive difference to what is right in the real world and what isn’t. Don’t forget about the front end of the bike either; bar height and reach can impact significantly on what happens behind. And what’s without thinking about physical changes a rider might experience over time. What works one day may not be optimal six weeks, six months or six years down the track. So how do you get it right? By using all the tools available; a combination of motion capture, dynamic measurement, observation and rider feedback. That last one is key, and a client who is more aware of their own sensations can quicken the process, making it a lot more hit than miss. So, the next time you’re riding, take some time to be aware of your pedal stroke and whether you feel it could be better. Because if you feel it could be better, than it probably can. This entry was posted in fit2ride news and tagged bike fit, bikefit, calderdale, cleat position, cycling, footbeds, halifax, lancashire, position, saddle height, Sidas, training, yorkshire on f 9, 14 by jamesr. We asked a couple of recent customers to put down in writing what they thought of their fitting experience. Here’s what they sent us. “I originally went to see James about my road bike set up. I was also interested in the custom footbeds he had and how they could help my flat feet. “Having the fit set me up in a much more comfortable, but still aggressive position that was great for descending and sprinting. “I also took the plunge and got a time trial bike this year; James was my first port of call with it. He took all the guesswork out of setting it up for me. “It takes time to get used to a TT bike and having that fit straight away means I can concentrate on getting used to it without any bad habits I might have developed by setting it up myself. “It’s got me improving my times faster than I expected. “The footbeds have also been a big success; really comfortable but also very supportive. “It’s now some six weeks since I had a morning with James at Fit2Ride adjusting my riding position. I’m a life-long cyclist and have generally felt pretty comfortable about my position. However, back pain led me to drop my saddle 2cm a year ago, with immediate benefits, so I arrived with an open mind, wondering if there were other positive modifications to be made to my position. “To cut a long story short, James moved my saddle forwards, pushed my cleats back and spaced out my pedals by a couple of mm. The latter was to correct a lack of alignment in my ankle, knee and hip. “He also homed in on my very broad, high-arched feet and recommended Sidas footbeds basically a bespoke, supportive inner-sole to correct a pronounced rolling-out of my feet on the downstroke. “None of the individual tweaks was particularly radical but I’ve noticed a number of benefits. The footbeds have given my feet more stability and also comfort. “The spacing out of the pedals and moving of the cleats and saddle have all combined to create the impression of a smoother, more grooved pedal stroke. “A tendency for my right knee to splay out at the top of the pedal stroke has been reduced and I’ve noticed that, when fatigued, I’ve still been able to maintain fluidity and a high cadence. “When tired, my natural style is to slog in a high gear, mashing at the pedals. This tendency has been reduced and although I’m aware of fatigue, I seem still able to hold a better position, especially with my feet, giving me a cleaner, more economical style and greater endurance that I might expect. “I suspect that the benefits will be even more apparent once I’m a little fitter than I am now. This entry was posted in fit2ride news and tagged bike fit, bikefit, calderdale, cleat position, cycling, footbeds, halifax, lancashire, position, saddle height, Sidas, training, yorkshire on f 12, 14 by jamesr. I did a fit for a friend of mine over the weekend. He’s a smart, experienced road rider, he’s been in the bike trade for 20 years and he’s pretty savvy when it comes to bike position. Which is why I was surprised at the number of relatively straightforward improvements we were able to make. Not big changes in a your-saddle-needs-to-go-up-four-centimetres kind of way, but subtle alterations that should still have a significant effect on his efficiency and performance. And that hit home just how difficult it is to fit yourself, even if you’re armed to the teeth with up to date theory. Because while a rider’s intuitive feel and feedback are one of the most powerful tools a bike fitter have at their disposal, it rarely reveals the full picture, simply because you can’t observe yourself as clearly as someone else can. Sure, you can get a long way along the road towards a decent position armed with a tape measure and some YouTube instructionals. But to really get the best out of yourself, whether that’s winning a race or just smashing your Strava times up your local climbs, you might need to involve someone else as well. This entry was posted in fit2ride news and tagged bike fit, bikefit, calderdale, cleat position, cycling, footbeds, halifax, lancashire, position, saddle height, Sidas, training, yorkshire on f 7, 14 by jamesr. If you’re a cyclist with £80 to spend on something to improve your riding experience, what can you spend it on? A new rear mech? Ceramic BB? A nice, light, colourful set of skewers? Titanium railed saddle? The list goes on. So why would you choose to splash your cash on something to put inside your shoes that no one ever sees? Well, the human foot is a clever and complex thing. But one thing those 26 bones were never meant to do was to be strapped into a carbon soled shoes and force a pair of pedals round and round for hours on end. They’ll do it, that much is undeniable. Whether they’re doing it efficiently is another matter. Every ounce of energy you transmit to the pedals goes through your foot. In almost every case, your foot will deal with those forces better if it has some support. That translates to stability, comfort, a better pedal stroke, less risk of injury and quite possibly a bit of extra power. Now, take the insoles out of your shoes and have a look; how much support do they give? Some will be better than others – and some very, very expensive shoes will have nothing but a fag-paper thin bit of foam in there – but even the finest generic product will struggle to offer the same advantage as something that perfectly mirrors your foot. A custom made footbed might not be an obvious upgrade, but it is one that will make a day to day difference to your riding.